Anywho, below you'll find some details around my most recent adventure across the pond. My guy and I planned a trip to Iceland this past October a few months back. It was a much anticipated trip, and man, this place sure didn't disappoint! Iceland is unlike anywhere else in the world I have ever experienced. 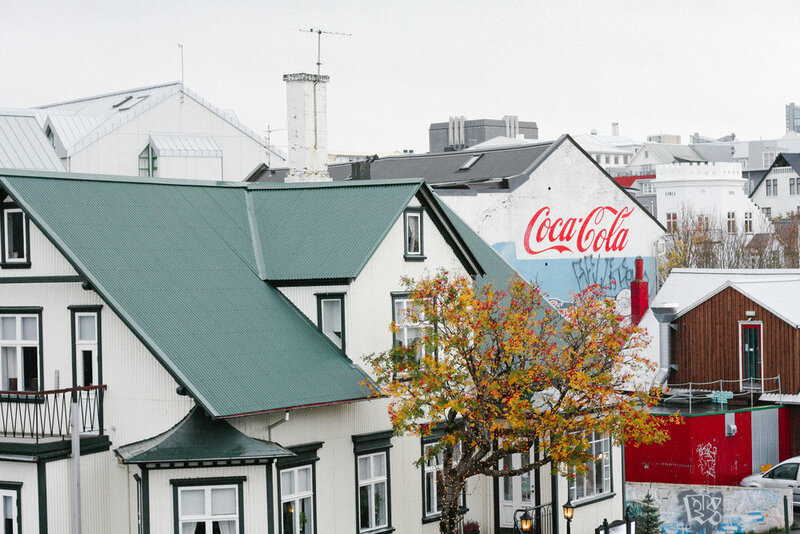 We wandered through the charming streets of Reykjavík, ducking into the coziest cafes and bars as we went, and then headed north to explore the breathtaking and otherworldly beauty of the Westfjords region. 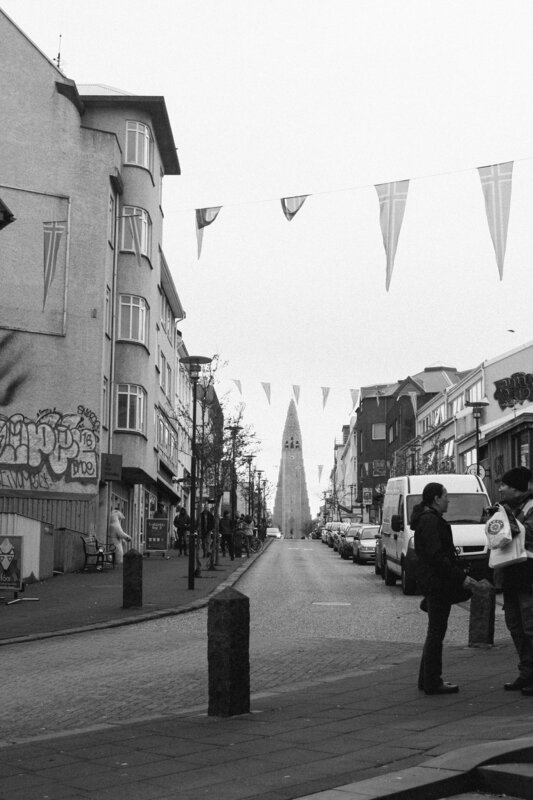 I loved Reykjavík. It's such a beautiful, unique, and charming city. I could have easily spent a few more days cozying up in their warm and welcoming coffee shops, wandering and window shopping, and eating more of those world famous hot dogs (SO good.) 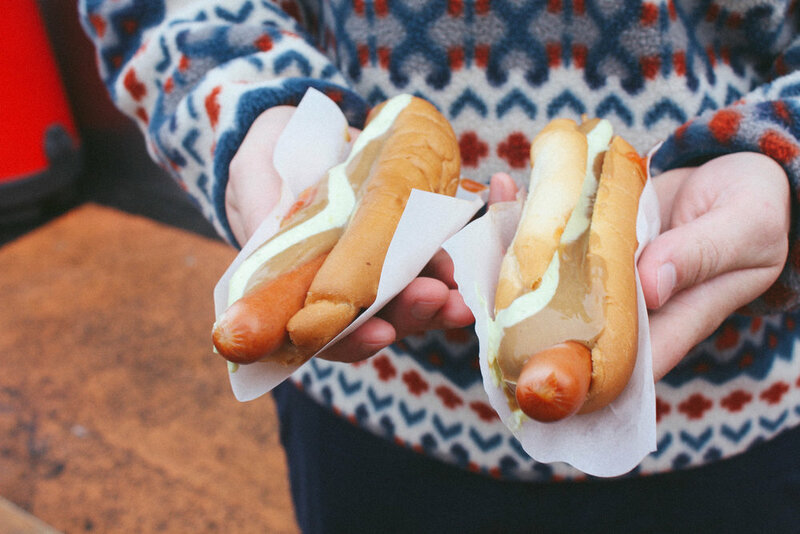 Reykjavík is Iceland's largest city, and has a whole lot to offer when it comes to food and drink. We stayed at the Kvosin Downtown Hotel, and I can't recommend this place enough. It's in the heart of the city, has tons of character, and the staff are all very welcoming and helpful. The rooms have everything you could possibly need for the perfect stay, and the boyfriend claims they have the most comfortable beds he has ever slept in (high praise.) There's also a cute and cozy wine bar on the first floor of the hotel, the perfect place to hunker down if the weather isn't clear and warm, something not uncommon in Iceland. Once we were settled in, we took to the streets to wake ourselves up with some good food after a long night of travel. We walked through town to the harbor's edge, and continued along the water until we hit the Coocoo's Nest, a bright and warm cafe. They serve up homemade soups and hearty sandwiches made on fresh, crusty sourdough bread. It was the perfect place for us to unwind and recharge. The rest of the afternoon was spent exploring Reykjavík by foot, napping (hello red eye flight,) and deciding where to head for dinner and drinks. We decided on a pizza place that I had read about that had intrigued me. It's an unnamed joint, that turns out delicious and hot sourdough crusted pizzas and a variety of tasty appetizers. It's an eclectic and friendly place, and an awesome pick for dinner after a long day of exploring. Though I can't give you a name, the address is Hverfisgata 12. After we ate, we headed up a flight of stairs to Mikkeller & Friends, a brewery/bar that was born in Copenhagen, and has since opened a location in Reykjavík. I loved going there while I was studying abroad in Copenhagen, so it was a fun place to share with DJ. The space is funky and colorful, and offers a bunch of beers on tap. We spent the rest of our night sippin' and chattin' about our plans for the next few days. The next morning we stopped in at Sandholt before hittin' the road. This bakery is light and airy and is a perfect pick to start your day. They have sooo many beautiful pastries and I wanted to try every single one. I settled on a massive, buttery cinnamon roll with a side of traditional Icelandic skyr. After people watching for a bit we left happy, warmed, and ready to take on the road. 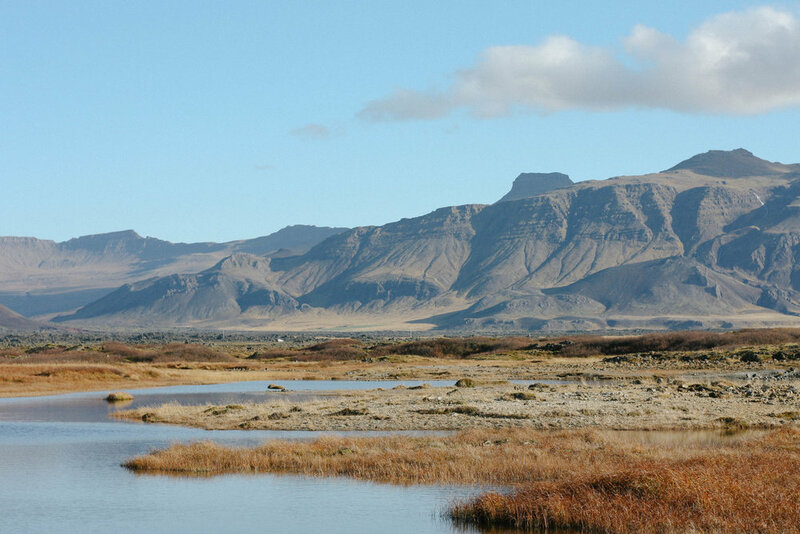 One of our favorite days of our trip was spent road tripping the Snæfellsnes Peninsula. Such a gorgeous and incredible place. There were so many "is this actually real?!" moments, and we couldn't believe just how many natural wonders were located in one relatively small stretch of the island. There are vast lava fields and glaciers, countless waterfalls and hidden hot springs, and jagged coastlines and black pebble beaches. Tiny, colorful, fishing villages sprinkle the coastline as well, and we had one of our best meals of the trip out there. One of the highlights of the day, of the trip really, was the natural hot spring we found in the middle of nowhere (really,) hidden in a sprawling lava field. It's on an unmarked road on the peninsula, and was so worth the wandering to find. After parking the car, walking a bit, and crossing a shallow stream, we reached the most beautiful little hot pot. It's just big enough to fit two comfortably, is about 5 feet deep, and felt like heaven at a steaming hot temp. We soaked for awhile before hopping back in the car and continuing on towards Snæfellsjokull National Park. On our drive we passed by the quaint fishing village of Arnastapi, and made a stop to explore the Londrangar Basalt Cliffs. If you're in the area, stop here! It's magical, and is said to be inhabited by elves. Next, we drove down a winding road through a lava field to Djupalon Beach, a black sand and wind swept place strewn with rusted metal from the shipwrecked English trawler Eding, back in 1948. There are also some crazy rock formations, one said to be an elf church and the other a kerling, or troll woman. You can feel the history in this wild place. We spent the rest of the day driving the coast, ooohing and aaahing over craters and waterfalls and golden cliffs that made me feel like I was back home on the PCH. Around dusk, we reached our final destination of Grundarfjörður. We ate dinner at the most welcoming and warm restaurant on the water, Bjargarsteinn mathus, and loved every minute of it. 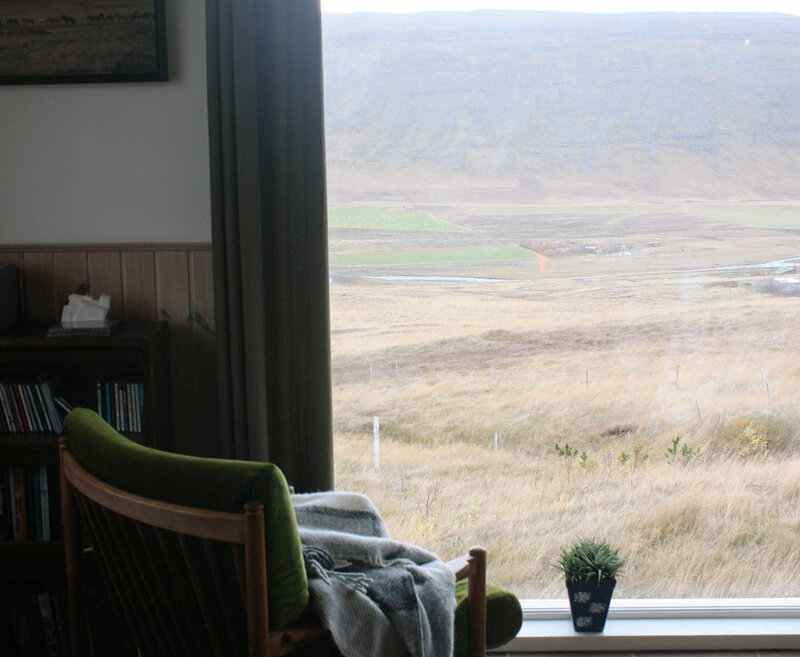 Our table was right by the window overlooking Kirkjufell, a beautiful mountain unlike any other I've ever seen. We watched the sunset and kept our eyes peeled for puffins while we dug into a hearty and amazing dinner. When it was time to leave I was thrilled to meet Arnar, the chef, and picked his brain about Icelandic food and his kitchen. Such a special space, definitely a meal to remember! We stayed in the most incredible and cozy cabin after venturing outside of Reykjavík. 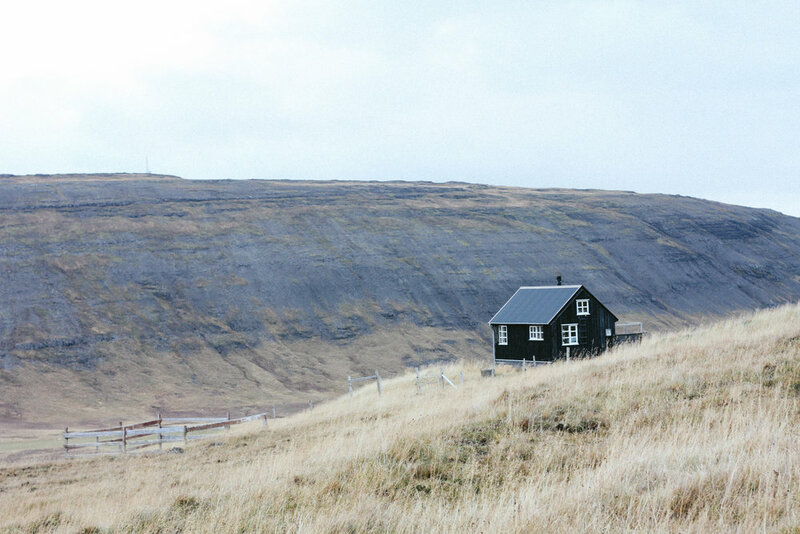 Our cabin was nestled in the hills in the northwest of Iceland, and it was the perfect base for exploring the rugged and raw terrain of this country. One of the highlights? 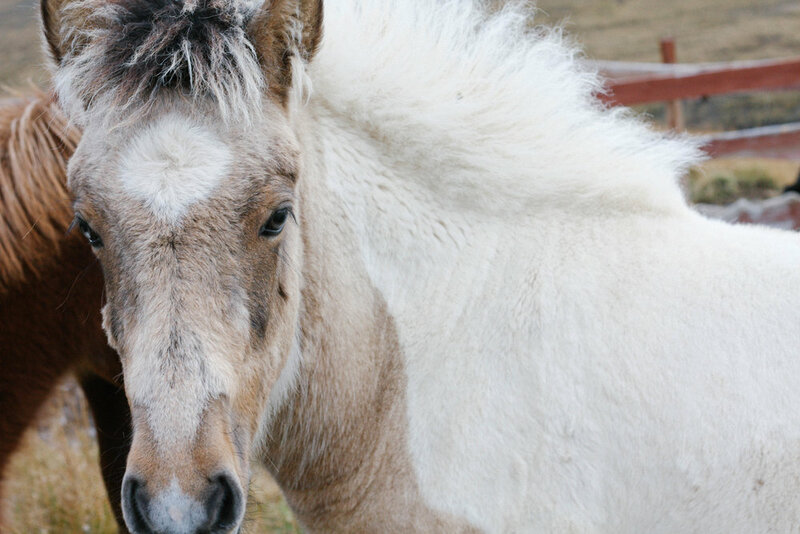 The beautiful Icelandic horses that roamed the valley! 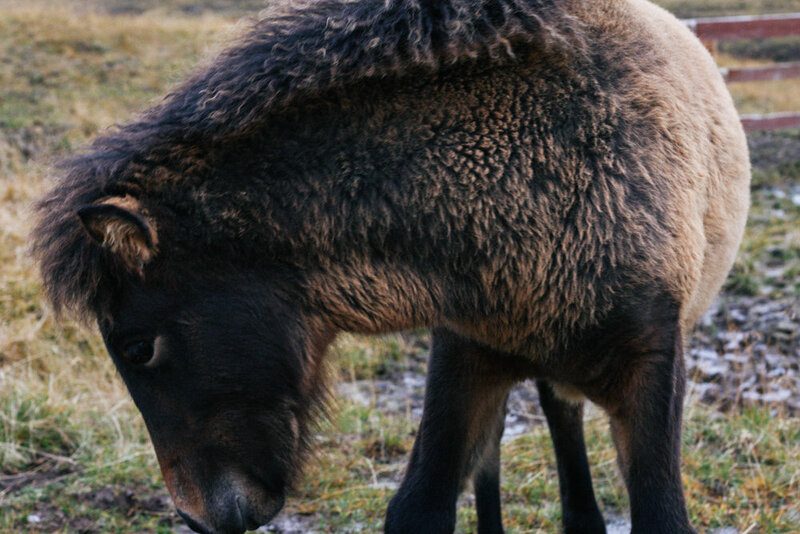 I could not get enough of these beautiful animals, and must have followed them around and coaxed them closer for at least a couple of hours. DJ is a patient man. Mornings were slow and spent perched in front of the window in the comfy green, velvet chair with a cup of tea in hand, watching the sunrise (around 8 am!) over the hills. We cooked our meals from scratch while listening to our host's impressive CD collection. From here we explored neighboring fishing towns, spent hours hiking the hills behind the cabin, got real cozy in front of the wood stove, played a lot of cribbage, and snuggled up under some Icelandic wool blankets with some good books. Kristján, our wonderful host, left a basket full of soft wool sweaters and blankets for our use. Needless to say, this place is special, and I wasn't sure I'd ever leave. It's been a long, long time since I shared on this space. The past few months have had their fair share of speed bumps, and they've pushed me to simplify and take some time for myself. For me, that meant time spent with family and friends, cooking and sharing nourishing, comforting foods, and reducing time spent on the computer and on social media. It was the right move for me to make at the time, but I've missed this space a whole lot! I understand that May isn't exactly citrus season, but it's been so darn cold some days, and then so hot the next, that I just need some vibrancy and zing in my meals that'll give me that little pep in my step while we wait for summer to settle in. This breakfast bowl can be enjoyed hot or cold, and can totally be customized to your liking. This one is just sweet enough without being overwhelmingly so, and I love that I can toss it all into a jar and take it to work with me when I'm tight on time (hello Mondays.) The ruby red grapefruit will wake you right up, the oats will keep you satisfied, and the ginger syrup will make your heart happy, guaranteed. This meal is a quick and simple one. In a separate saucepan, bring sugar and water to a boil over medium-high heat, stirring constantly to dissolve sugar. Add sliced ginger and heat until the mixture simmers. Remove the saucepan from heat, and allow to sit and cool for 30 minutes. Use a sieve to strain the syrup into a jar. Set aside. *This recipe will make more than enough, so you'll have some leftovers to enjoy at a later date! While your ginger syrup cools, bring your almond milk to a boil. Once reached, add rolled oats and chia seeds, and immediately reduce heat to medium. Cover and allow them to simmer for around 5 minutes. *Do not stir - doing so may lead to weaker and soggier oats! Remove from heat once cooked, add a splash more almond milk if desired, and transfer to your breakfast bowl. Now comes the fun part :). Add a big dollop of greek yogurt, wedges of ruby grapefruit, a handful of walnuts, a big pinch of coconut flakes, and top it all off with a drizzle of fresh ginger syrup. Middle school is my first real memory involving football. Mr. Thielman's PE class, 7th grade, and a whole lot of time spent running up and down the field, usually without any idea of where, exactly, I was running to. I guess you could say that field sports have never really been my thing, especially football. Playing it, throwing it, even watching it has never really stuck. I was the string bean with her head in the clouds practicing her fouette turns and pirouettes on the turf, to Mr. Thielman's dismay, and I much preferred my version of football to his. I just remember thinking that there were so many rules, so much stopping and going, and I just didn't have the patience for it. I have the attention span of a gnat when it comes to watching sports games, but the combination of friends and (always) good food gets me in the spirit and excited for the occasional game. Growing up, my dad would take me to see the Padres play on Sunday afternoons. We'd zip over to San Diego, mitts in hand, and I'd be contemplating the treats I planned to eat. There were always charred sausage dogs with peppers, onions, and a whole lot of yellow mustard. We'd sometimes get nachos, cotton candy (always blue, per my request,) and would almost always finish the day with a massive cone of swirled soft serve. I loved these Sundays with Dad, and they're absolutely the root of my love for game time treats. While I absolutely love all of the foods listed above, and then some, I always appreciate a lighter option to crunch on while a game is on. With Super Bowl Sunday coming up quick, I've started thinking about what I'll be bringing to the party this year. Enter: this onion dip. It's creamy, simple, and a total crowd pleaser. You can enjoy it with raw veggies, crackers, or salty potato chips (my achilles heel), making it the perfect snack platter to bring to a gathering, sports related or not. It's deceivingly healthy, so whip up a bowl and dig in without even thinking twice. What snacks are you cooking up for Super Bowl Sunday this year? Be sure to share your thoughts below! Heat a large cast iron pan, pour in a few glugs of olive oil (~1/4 cups). Add chopped onions and a pinch of salt. Adjust heat to medium. You're caramelizing your onions, which will take some time and patience. Stir your onions frequently and do not increase heat. Your onions will slowly being to deepen in color. The onions are done when they are a rich brown color. This process will take between 15 - 30 minutes, longer if you crowd your pan. *Note - if your onions begin to burn, reduce your heat a bit and add a splash or water, wine, or balsamic vinegar to your pan and continue to cook. When the onions are near done, add garlic and allow to cook for a few minutes. Remove the pan from heat and stir in your Worcestershire sauce. Allow the onion mix to cool. Combine your onions and greek yogurt in a medium mixing bowl, stirring until evenly mixed. Fold in a generous amount of fresh ground black pepper and salt to taste. Top with a handful of chopped scallions. Enjoy your onion dip right in that moment, or store in the fridge for up to two days. The dip tastes the richest and creamiest if it's allowed to sit for a few hours before consuming, in my opinion. :) Enjoy! It's been a crazy long time since I've posted on here, but it's been a wonderfully full and happy month away as well. I spent the holidays back home in California, and it was just what I needed. There was a whole lot of family time, days spent away from my computer, and some...tons, of seriously good tacos. ** Dear Boston, up your taco game now por favor! The salty air, sunshine, and fresh-squeezed orange juice (thanks Dad!) re-energized me, while fireside chats with family and long beach walks with friends centered me. 2015 was brought to a sweet close, and 2016 started with some of my favorite people in one of my favorite places on earth, and I was feeling all sorts of grateful for the slow and easy days. Now back in Boston, I've been settling in as another winter settles into the city. I've been in serious nesting mode, gettin' cozy for the chilly and gray days ahead. I'm determined to fill my space and my body with as much warmth and light as possible this season, and for me that all starts with food. The sun can hide for weeks at a time around this time of year, so I try to stay active and brighten my days with colorful and nourishing foods. This bowl is one of my go-to's in the winter months, and is so simple to throw together. It makes you feel good from the inside out and can be modified and mixed up however you please! Assemble one of these power bowls to warm your bones and to lift your spirits. So, light a candle, wrap yourself up in a big blanket, and tuck into some color. You'll feel cozy to the core. Line a large baking sheet with parchment paper. Evenly spread sweet potato pieces out on the baking sheet. Drizzle with a healthy amount of good olive oil, tossing each piece to coat evenly. Sprinkle generously with salt and fresh cracked black pepper. Roast in the oven for 40 - 45 minutes. Next, bring rice and water with a pinch of salt to a boil, uncovered, over medium-high heat. Once boiling, cover, reduce to a simmer, and let cook for 35 minutes or until most all water has been absorbed. While the potatoes and rice are cooking, prep your other ingredients. For the turmeric citrus dressing - Combine the turmeric, garlic, lime juice, greek yogurt, honey, peanut butter and 1 Tbsp of olive oil using a blender or food processor. At this point, this mixture will be thick. Once combined, continue to add olive oil in small amounts until desired consistency is reached (~4 Tbsp olive oil total.) Taste, and season with a dash or two of cayenne pepper, black pepper, and salt. You may need to adjust the amount of lime juice to your liking. Blend until smooth and set aside. Once the rice and potatoes are done it's time to assemble your power bowl! Place a big handful of spinach in a bowl, and top with desired amount of roasted sweet potatoes, feta cheese, walnuts, black rice, chickpeas, and sliced avocado. *You'll have plenty of left over potato wedges, chickpeas, and rice for your next power bowl. Next, drizzle with turmeric-citrus dressing and dig in! As I write this I’m sitting in a favorite coffee shop of mine, watching people wrap lampposts with garlands and frost storefronts with white lights. It’s officially the holiday season, and even though it’s a total cliché, I really do believe it’s the most magical time of the year. The past few weeks have been a whirlwind, and between a career change, hosting a friendsgiving, and preparing for the Thanksgiving holiday, there’s been little time to sit down and just be still. This time of year has a way of slowing me down, reminding me to count my blessings and to spend lots of time with loved ones. I’d be lying if I told you my move to Boston has been easy. I’ve adventured to new towns and cities before, moving from southern California to Vermont for school, then hopping on over to the coast of Maine for a seasonal stint, then on to Boston. I’d be lying to you if I told you my move to Boston didn’t involve a certain boy, but it was for more than that. It was for the adventure, the challenge, and the excitement that comes with a new place, and while this move proved to be all of these things, it was also really, really hard. The city felt overwhelming, nothing like the safe and comforting home my dear friend Lizzy and I had made on the farm in Maine. I didn’t have my girlfriends from college to snuggle up on the couch with or have a beer on the porch with, and it was isolating. There were tears and many moments of self doubt, many moments of “I give up, I just want to go home.” The problem, I soon realized, was which home? Home to my family in California? To my home in Vermont? To Maine? There was no quick fix, and as I began getting into the swing of things in my new neighborhood, every once in awhile I’d feel this little ping in my chest, that feeling of warmth that comes with comfort, that feeling of “you are where you’re meant to be in this moment.” I slowly began to feel more at ease, and with that came the confidence to reach out and branch out. Another cliché, but it’s taken me more than a year to “find myself,” in this city. I've navigated a few new career paths, created Home Sweet, and explored new places with new people. It’s a process, and through it I have befriended some incredible and inspiring individuals. A week or so ago I had some girlfriends over for a friendsgiving feast, one involving warming, seasonal dishes, pretty cocktails, and plenty of champagne. Space was minimal, as there were eight of us in my 250 square foot apartment, but it was the best kind of cozy and I had an absolute blast hosting. As we ate and passed plates, I felt that ping, that feeling of “I am where I’m meant to be”, and was so happy for it. In that moment, I felt at home. My move to Boston has had its challenges, but each one of the ladies sitting around me at the table has inspired me to follow my passions and has lifted me when days felt a little grey. They've helped to make this place feel like home, and for that I am so thankful. After a week spent with good friends around the dinner table, I found myself with some leftover friendsgiving ingredients in my pantry begging to be whipped up into something tasty. I wanted to make something simple and just a bit sweet, something I could pass off as breakfast on one of those running-out-the-door-can't-find-my-keys kind of mornings (not unusual in my world.) This slightly sweet and tangy pumpkin bread is all of the above and more. The greek yogurt and coconut oil make this loaf so satisfying, and the cranberries and walnut pieces add a great crunch and zing to it. This pumpkin bread is the best sort of "on the go" breakfast, and is equally enjoyable shared in good company over tea and coffee. Wishing you all a warm and happy holiday season. I hope it's full of good food and friends who make you feel at home. In a large bowl, combine pumpkin puree, greek yogurt, egg, melted coconut oil, vanilla extract, and brown sugar. Set aside. In a separate bowl stir the remaining dry ingredients together. Add dry ingredient mixture to your wet ingredients, mix until evenly combined. Fold in cranberries and walnut pieces, adding more or less depending on personal preference. Line a bread pan with parchment paper, scoop pumpkin mix into the pan, and sprinkle the top with cranberries and walnut pieces. Bake on the middle oven rack for 45 - 55 minutes, or until you're able to insert and remove a toothpick cleanly. Remove and let cool for 15 minutes or so before slicing. Last weekend felt heavy. I'm having a difficult time wrapping my mind around it's events, around the stories of survival and heartbreak. It's all so senseless, and I just feel indescribably sad for our world and our people. Last weekend I surrounded myself with the people I love, cozied up with a good book, cooked up some comforting food, and enjoyed a long drawn out brunch with my good friend, Alice. We talked about work, love, city life, goals, reminisced on our time in Vermont together, felt all kinds of nostalgic, and managed to eat a basket of pastries while we chit chatted. Slow Sundays like this feel luxurious, and they're my absolute favorite. Long, lazy meals are a treat on weekends, but they don't have to take hours of prep and long lists of ingredients. I'm all about simple, tasty, and colorful meals, and chilaquiles checks all the above. Not only is it a snap to whip up, it's also a great "this is what I have in my fridge and pantry and I need to use it before it goes bad," sorta dish. This batch of chilaquiles brightened my day, felt nourishing and comforting, and was fun to throw together. It will definitely be a staple and pick me up through the winter months to come. Thankful. For all of the family and friends I'm lucky enough to call my own. And for these tasty lookin' chilaquiles I'm about to tuck into. While your chips are crisping, heat a pan over medium heat. Add a dollop of olive oil, heat, and toss in your diced garlic. Let garlic cook for a minute or two before adding the kale. Stir with a wooden spoon to evenly coat kale and allow it to cook for a few more minutes until it has cooked down significantly. *Note, you don't want to crisp the kale as it will be going in the oven soon. Remove your tortilla chips from the oven. They should be crisp but not yet browned. Place in a bowl and toss with ~4 oz red enchilada sauce, evenly coating the chips. Place chips in an 8 inch cast iron or oven safe pan, then adding the black beans and sautéed kale and garlic. Sprinkle some of your shredded cheese on top of your chips. Now, with a wooden spoon or your fingers, gently create shallow divots throughout the mixture to accommodate your eggs. Gently crack eggs into each space, sprinkle the rest of your cheese on top, and place in the oven for roughly 10 minutes or until the eggs are just set and the cheese has melted completely. Top with cilantro, avocado slices, cortija cheese crumbles, a dollop of greek yogurt, a dash of hot sauce, and a squeeze of lime. Dig in and enjoy while it's hot with your brunch buddy. It's been awhile since I've had a weekend wide open to relax and catch up. While I love weekend road trips and exploring new corners of New England, there sure is a whole lot to be said for waking up slow on a Saturday morning, long riverside runs, and taking the time to re-energize and simply be. A change in season always helps to remind me to slow down and savor the simpler things. When the temps outside begin to drop, I tend to seek comfort and coziness. The down comforter is broken out, wool socks are donned, and hearty food is roasted and warmed. The fall colors this year have got me like woah, and I decided to make something to match the golden leaves on the trees outside my window. This soup is creamy and decadent and warms you up from your fingertips to your toes. 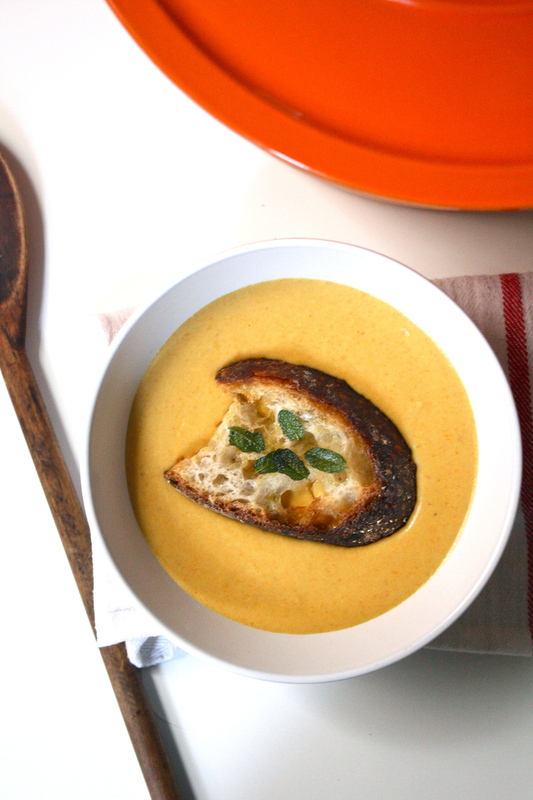 Enjoy a big bowl of this cheddar apple ale soup with crispy sage toasts to dunk and crunch on. In a large dutch oven melt butter over medium heat. Add the onion, celery, carrot, and garlic to the pot. Cover and stir occasionally for about 10 minutes, add diced apples, and cook for another 10 minutes, or until vegetables are softened. Stir in the flour for a few minutes, then add the ale and stir. Next mix in the light cream, worchestershire sauce, and vegetable broth. Turn up heat to medium-high to bring soup to a simmer. Once simmering, cover and reduce heat to medium-low and cook for 10 - 12 minutes. Remove soup from heat and puree contents in batches or with an immersion blender until smooth. Place the soup over medium-low heat and add the grated cheddar cheese to the pot in handfuls. Stir constantly to evenly melt throughout soup. Season with salt and pepper to taste. Cover until ready to serve. Heat oven to broil, drizzle bread with olive oil, and place in the oven for 5 minutes. These will crisp up quick so keep an eye on them! While the toasts are crisping, pour a generous amount of olive oil into a small skillet. Once oil is hot, add sage leaves. The oil should pop and bubble when the sage leaves are added. Heat for 2-3 minutes and remove from the skillet. Take the toasts out of the oven, sprinkle with crispy sage and flakey salt, and serve on top of or on the side of soup. Be sure to follow @homesweet_mary on instagram and tag #HSrecipes when you try out a recipe!